Ammy code is actually compiled to XAML. 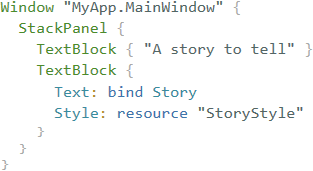 This means that any complex thing you could do in XAML you can also do with Ammy. Which would be much easier, thanks to concise syntax and mixins. Ammy is designed with a goal to make coding less tedious. Fewer symbols means it’s easy write and maintain. No project configuration needed. Just install a nuget package and you are good to go. Contact us anytime via means listed at the bottom of the page. We strive to help everyone as fast as possible. 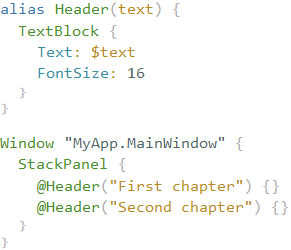 What makes Ammy better than XAML? Mixins allow you to encapsulate often used patterns into small combinable components. If you are familiar with HTML/CSS then you can say that mixin is an upgraded version of CSS class. With mixins you can separate logic from presentation, apply premade triggers, reuse animations and much more. Alias is very similar to a mixin, but where mixin defines a set of properties, alias defines an element. Most of the stuff from mixins also applies to aliases. You could describe alias as a lightweight alternative to UserControl that can accept parameters. Ammy allows you to define binding converters inside markup. A binding converter is represented by a C#-like code, that looks like a lambda expression. It can do most of the stuff lambda expression can: comparisons, method calls, constructors etc. Once defined, a converter is serialized as a string and later deserialized as Expression Tree. All converters are cached, meaning only first usage will involve deserialization. Developing UI on a running application feels like an actual magic. You can change anything in markup and instantly see an update on a screen. Most importantly all your bindings work and represent actual running data. If you are designing a twitter client you would see new tweets appear, while you change their appearance at the same time. Or, imagine there is a big data entry form you need to create. You can arrange inputs, setup bindings, apply validation and all of that while your app runs and shows actual data. You can click stuff and see that it really works. In a few clicks, you can upgrade you current XAML project to Ammy. 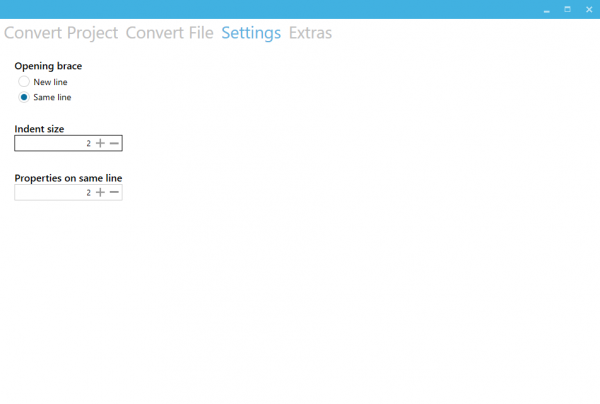 The converter will translate every XAML file to Ammy and update project file with required item references. 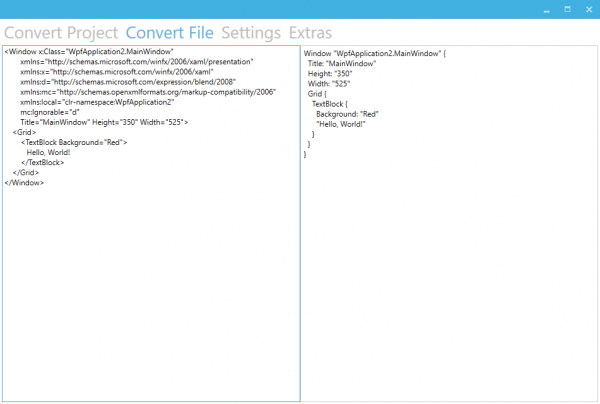 You can also convert singular XAML files. Just paste file contents and copy resulting Ammy markup. There are formatting options that can be configured to suit your particular coding style and application. Watch the development of a simple data entry application. Note that application was always running during the development, never needing to restart. Also note how window structure and presentation are separated. Structure being in MainWindow.ammy file, while all presentation resides in MainWindowMixins.ammy. Skip to 24:30 if you want to see resulting code and application. Live development of a small shopping list scanner application using Xamarin Forms and Android emulator. 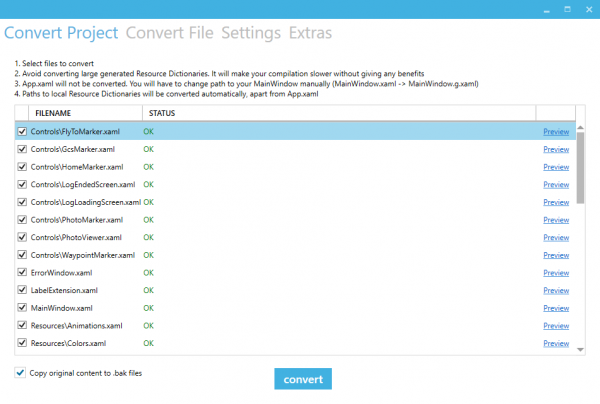 Showcases Mixin and binding converter usage. Reasonable prices, great quality, and fast execution. Do you like Ammy? Share your feelings!